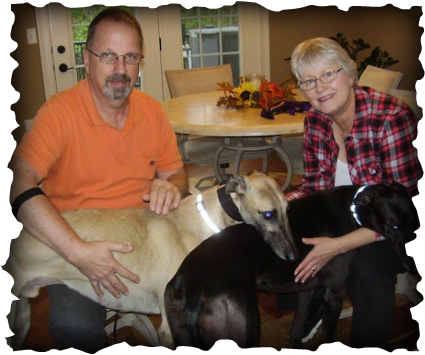 Timid fawn boy Willie Cool needed a special home and he found the perfect place in Dayton with Robin and Mike. Cool, now called Miles, is content to be a follower, while black greyhound Maddie is a confident girl who likes to be the leader, so they make a good pair. Little mixed breed Baxter (who wandered out of the frame when the photo was taken) is actually the alpha dog, but he gave Miles his vote of approval as well. Handsome Miles will want for nothing and has a wonderful life ahead of him!